Maidstone Museum has been spoilt recently, with the magnificent Brick City exhibition by renowned LEGO® artist Warren Elsmore being on display to residents and visitors of Maidstone. The exhibition, which runs throughout the summer holiday, has been an eagerly anticipated since it was first announced, with kids (of all ages!) excited by the potential of seeing some of the world's most iconic landmarks in miniature form. Once the time came to open the exhibition, there was no disappointment to be found, with Elsmore's meticulously crafted displays simply breathtaking. 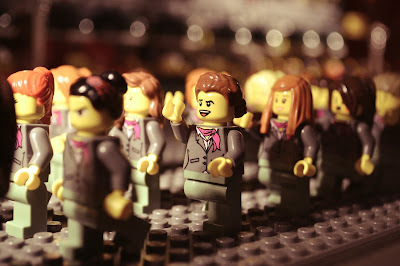 Taking in a number of iconic attractions and evoking the spirit of some of the world's most vibrant events, the Brick City exhibition has proved a massive hit, with children and adults alike revelling in the enduring appeal of the famous toy. To mark the success of the success of the exhibit, and to celebrate the fantastic work of Elsmore and the entire team at Maidstone Museum, we're pleased to provide out five favourite LEGO® structures of the Brick City exhibition. 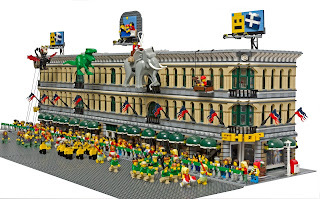 Comprised of a staggering 180,000 pieces, the magnificent recreation of St Pancras International station in London is arguably the star of the Brick City exhibition show. This grand structure, which is set in a room away from the rest of the exhibition, features a number of 'Easter Eggs', with miniature replicas of such notable characters as Robin Hood, Batman, and more hidden among the crowds. It's one of the most awe-inspiring feats of architecture anywhere in the world, so it's no surprise that the miniature LEGO® is equally as impressive. Though the design looks somewhat sparse and simple, construction was anything but, taking nearly 3,000 pieces to complete. It's not quite big enough to host gladiatorial battles, but it's certainly big enough to impress! 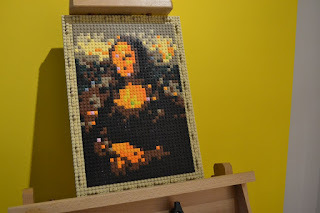 Arguably the most famous image ever painted, the majestic Mona Lisa is painstakingly recreated in LEGO® for the Brick City exhibition at Maidstone Museum. Tucked away in the corner of the exhibition room, you'd be forgiven for letting it pass you by, but missing out would be a fantastic shame. Unfortunately, we're no closer to understanding the mysterious smile of the figure in da Vinci's masterpiece, but it remain a fascinating sight to behold. 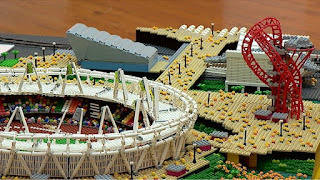 Another structure that almost defies expectations, this painstaking recreation of the Olympic Stadium in London is magnificently detailed representation of a modern sporting arena. More than 120,000 LEGO® pieces were used in the construction of the model, but its intricacy is enough to evoke the memories of Mo Farah, Usain Bolt, Jessica Ennis, and many more. Though is may be a tradition we're not quite familiar with here in the UK, this exceptional representation of the renowned Macy's Mayday Parade is magnificent in its detail. Featuring a host of figures all in parade, as well as the replicas of the grand balloons that form part of the celebration, this is a wonderful display of colour and vibrancy.